Imposition is at the heart of off-set production costs – affecting throughput, material usage, and labor. 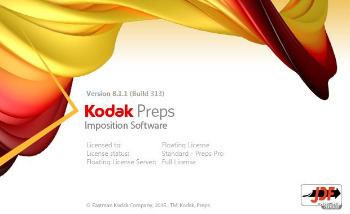 Take control of production efficiencies with KODAK PREPS Imposition Software – the leading solution for error-free impositions and one of the most widely used tools in the printing industry. You can now save a Custom Fold Pattern with a section that includes independent pages. When adding these fold patterns to a Press Run, you will be prompted to set the independent page properties. Preps can now define subsections (or ribbons) in Custom Fold Patterns. This means that you can use Preps to create a multi-web layout, save it as a custom fold pattern, and then generate a web press run with the custom fold pattern. You can now set output defaults for layout reports. If you are working with Preps templates that have marks already defined on templates/signatures, you now have the ability to remove all existing marks through the JDF import process. You can then use SmartMarks based on marks rules to replace them. The Auto Shingling and Bottling rules are now defined in Resources > Shingling and Bottling Rules Editor, rather than being defined as a Stock (Substrate) resource property. This means that you no longer need to define multiple Stock (Substrate) resource properties for this purpose. In the new Shingling and Bottling Rules Editor, you will have all the same abilities defined in the Stock (Substrate) resource, plus additional fields to define a range of the Stock (Substrate) paper weight and caliper. An Auto Shingling and Bottling rule will be triggered when a Stock (Substrate) resource that fits the range is specified. You have two ways to apply the Auto Shingling and Bottling rules: manually (in a Job Layout Details dialog box) or automatically. To apply the rule automatically, in your Preps profile, set -AUTOSHINGLING and -AUTOBOTTLING to YES. When new jobs are created, the Auto Shingling and Auto Bottling will be automatically set in the Job Layout Details dialog box. The default is NO, so that you can control the use of Auto Shingling at a job level, as needed. You can now edit a SmartMark setting for placing marks on press runs that allows you to restrict the mark to printing only on the Job layout report. The mark will not print on the production layout. When your production includes signatures made up from different binding styles—for example, you have two perfect bound signatures that are made up from three saddle stitched signatures each–you can now use Mixed Binding collation marks. In the example, the perfect bound signatures are the top level and each will get a signature number for the collation mark. The saddle stitched signatures get the same signature number as the parent and a tic line below indicating its number within the parent signature.